This article deploys an app to App Service on Windows. To deploy to App Service on Linux, see Create a PHP web app in App Service on Linux. Azure App Service provides a highly scalable, self-patching web hosting service. 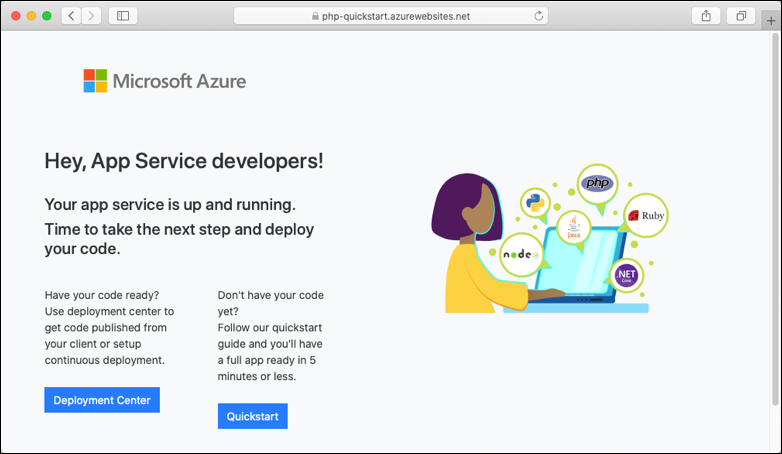 This quickstart tutorial shows how to deploy a PHP app to Azure App Service. You create the web app using the Azure CLI in Cloud Shell, and you use Git to deploy sample PHP code to the web app. In a terminal window, run the following commands. This will clone the sample application to your local machine, and navigate to the directory containing the sample code. Run the application locally so that you see how it should look when you deploy it to Azure. Open a terminal window and use the php command to launch the built-in PHP web server. Open a web browser, and navigate to the sample app at http://localhost:8080. You see the Hello World! message from the sample app displayed in the page. In the Azure Cloud Shell, configure deployment credentials with the az webapp deployment user set command. This deployment user is required for FTP and local Git deployment to a web app. The username and password are account level. They're different from your Azure subscription credentials. In the following example, replace <username> and <password>, including the brackets, with a new username and password. The username must be unique within Azure. The password must be at least eight characters long, with two of the following three elements: letters, numbers, and symbols. You get a JSON output with the password shown as null. If you get a 'Conflict'. Details: 409 error, change the username. If you get a 'Bad Request'. Details: 400 error, use a stronger password. The deployment username must not contain ‘@’ symbol for local Git pushes. You configure this deployment user only once. You can use it for all your Azure deployments. Record the username and password. You need them to deploy the web app later. In the Cloud Shell, create a resource group with the az group create command. The following example creates a resource group named myResourceGroup in the West Europe location. To see all supported locations for App Service in Free tier, run the az appservice list-locations --sku FREE command. In the following example, replace <app_name> with a globally unique app name (valid characters are a-z, 0-9, and -). The runtime is set to PHP|7.0. To see all supported runtimes, run az webapp list-runtimes. You’ve created an empty new web app, with git deployment enabled. The URL of the Git remote is shown in the deploymentLocalGitUrl property, with the format https://<username>@<app_name>.scm.azurewebsites.net/<app_name>.git. Save this URL as you need it later. Browse to your newly created web app. Replace <app name> with your unique app name created in the prior step. Back in the local terminal window, add an Azure remote to your local Git repository. Replace <deploymentLocalGitUrl-from-create-step> with the URL of the Git remote that you saved from Create a web app. Push to the Azure remote to deploy your app with the following command. When prompted for credentials by Git Credential Manager, make sure that you enter the credentials you created in Configure a deployment user, not the credentials you use to sign in to the Azure portal. Writing objects: 100% (2/2), 352 bytes | 0 bytes/s, done. remote: Preparing deployment for commit id '25f18051e9'. remote: Handling Basic Web Site deployment. The PHP sample code is running in an Azure App Service web app. Congratulations! You've deployed your first PHP app to App Service. In the local terminal window, commit your changes in Git, and then push the code changes to Azure. git commit -am "updated output"
Once deployment has completed, return to the browser window that opened during the Browse to the app step, and refresh the page. Your web app's Overview page will be displayed. Here, you can perform basic management tasks like browse, stop, start, restart, and delete. The left menu provides different options for configuring your app.